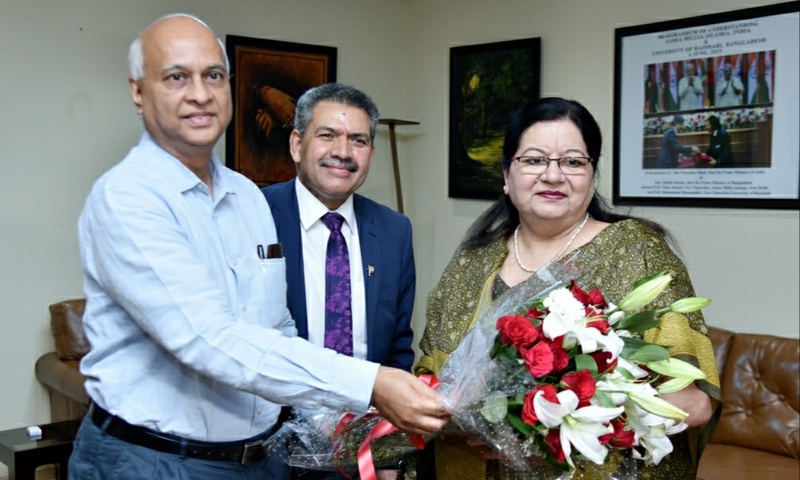 New Delhi: Prof. Najma Akhtar has today assumed the charge of Vice-Chancellor, Jamia Millia Islamia(JMI), New Delhi . Hundreds of teaching and non-teaching staff of JMI including office bearers of Jamia Teachers’ Association(JTA), Jamia Administrative Staff Association (JASA), Jamia School Teachers’ Association(JSTA) and SRK Association were present in the main administrative block of the university to give her a grand welcome.The whole JMI fraternity assured her of sincere cooperation. Before assuming the office she addressed the people who were present outside the VC office to welcome her. Prof. Shahid Ashraf, Officiating VC, JMI, Mr. A. P. Siddiqui(IPS), Registrar, JMI, Deans of Faculties, Heads of the Departments, Directors of Centres, Officers of the university and other senior faculty members of the university welcomed her inside the VC office. After completing the formalities Prof. Akhtar assumed the charge of the Vice-Chancellor of the JMI. Speaking on this occasion Prof. Akhtar said, “ It is a big responsibility and I’ll try to live up to the expectations of the Jamia fraternity”. A widely acclaimed educationist, Professor Akhtar is the first woman Vice-Chancellor of Jamia Millia Islamia, as also the first woman Vice Chancellor of any central universities in Delhi. It is a progressive land mark in the history of educational leadership and a matter of pride for Jamia Millia Islamia. Under her able leadership JMI may expand, prosper and provide safe and robust environment of learning attracting the talent from all parts of the country and abroad and will strive to achieve the status of one of the World Class Universities.